This month the Volunteer Spotlight shines on Joanne Smith. Joanne grew up in that “Other Twin City”, Minneapolis. Her schooling was with the Benedictine sisters at St. Bridget’s and the St. Joseph sisters at St. Anthony of Padua High School and many interesting characters at the University of MN, where she earned her degree in elementary education. 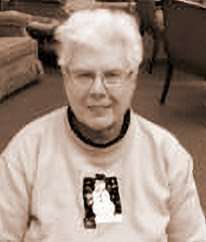 Joanne became a member of St. Matthew’s in 1969. Her family had grown with the adoption of two mixed race boys who were ready to be baptized. Personal exploration concluded that St. Matt’s appeared the most open to a diverse population. Her family over time was composed of seven children – adopted, homemade and step, which have now blessed her with eighteen grandchildren! From 1972-1988, while her children were attending schools in West St. Paul, she was an officer in PTA at all levels and on a couple district committees. As parents, she and others were proud of initiating the removal of asbestos from Sibley HS and starting a parent volunteer program in the elementary schools. Joanne began volunteering at St. Matthew’s in 1973 when the parish started a Faith Formation program for children aged 3 – 7. This program took place during the 1O am mass and was held in the school. A much younger Sister Anne Becker would come to each room and lead the children in song with her guitar. The pro- gram lasted about 3 years. Joanne continued with the CCD program until her boys were confirmed. She is now involved with the sacramental preparation. Joanne said that in assessing where she gave her time, she decided it was in the pursuit and sharing of treasures. Liturgy guides her and nourishes her, so she served on liturgy committees, as a liturgical minister, a funeral sacristan and as a Eucharistic Minister to the homebound and to Cerenity Nursing Home. She values responsible stewardship, so she is now a money counter as well as a member of the Parish Council and Fi- nance Council. She values community and hospitality so she is an officer of the CCW/Rosary Society, headed a Christmas program at Neighbors and served on the board of Wakota Credit Union in SSP. Joanne explained her service to St. Matthew’s parish in this way, “The value of volunteering has been significant to me for a LONG TIME!! !” We as a parish are very fortunate. Joanne’s dedication to the stewardship of Time, Talent and Treasure has benefitted our parish in so many ways!